When I was little, my mom used to take us to the thrift store. She liked one in particular, but we would go to several different stores. My Grandma used to call it The Junkie Store. which meant lots and lots of treasures to be discovered. High heeled shoes, and fancy little brass make-up compacts. I would stand there and imagine the lady that once held that make-up compact. Was she beautiful, elegant and worldly? In my young mind, she always was. grass Hula skirt, roller skates that fit me, and a Monkee’s album! To this day, I am still an avid thrift shopper. It was a very satisfying feeling when last year, for the first time, my 15 year old daughter said, “Mom, can we go thrift-store shopping? I need some cool clothes and stuff.” Although I had to act casual about it, it was music to my ears. She was paying attention..
Hollister (and the mall pretty much in general) has got me on the verge of contempt. Besides the fact that it’s wastefully over-priced, there’s no..imagination. Here kid, buy this. And they all do. For practically my entire life, I could find almost anything I was seeking out at thrift. This morning I stopped at the store right around the corner from me to get myself a large crock-pot for soaping. I wanted to try a new method (for me) called hot-process. With this method, you cook the soap in the crock until neutral. 4-6 week cure for the cold-process method. Within all of 15 minutes, I found this great big 7-quart pot, and low and behold, today, orange sticker items were 50% off. Of course they were. The thrift gods love me, and I love them back. 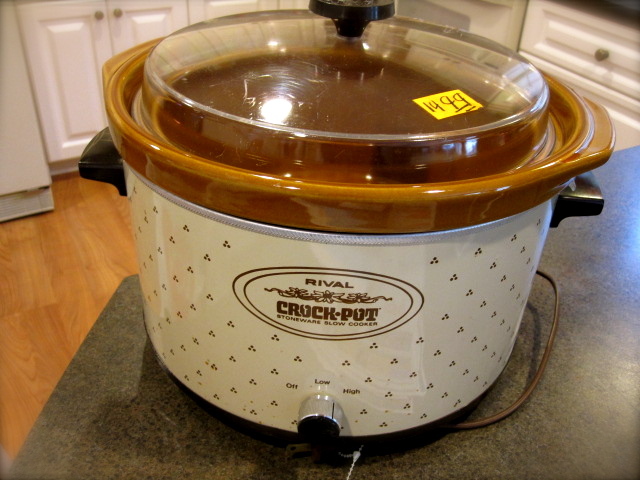 I paid $7.50 for this perfect specimen of a crock-pot! spray you with perfume as you walk in the door. Posted in My Hand-Made Soap and tagged crock pot, hot-process soap making, shopping, slow cooker, thrift store. Bookmark the permalink.